I have to confess, I took the quiz twice, and the first time I came out as Elinor Dashwood. I didn't try again in order to change the results, but because I didn't notice that I had to add the pic's URL on my own... 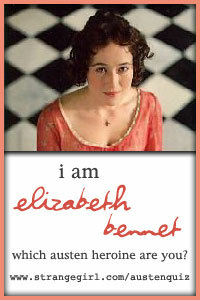 But I'm also not complaining that I get to be Miss Elizabeth Bennet ... now if only I could get my own Mr. Darcy!